Prudent, earlier known as Satya, drew in Rs 283.73 crore in corporate donations in 2016-17, and contributed over Rs 252 crore of it to the BJP alone. New Delhi: The funding of political parties by industries and business houses has been surrounded by a some mystery and innuendo for decades. Some of that was sought to be addressed by the formation of electoral trusts, bodies set up to collect and disburse funds to political parties. But true transparency, at least as far as electoral trusts were concerned, came about only in 2014 when the Election Commission made it mandatory for them to disclose details. 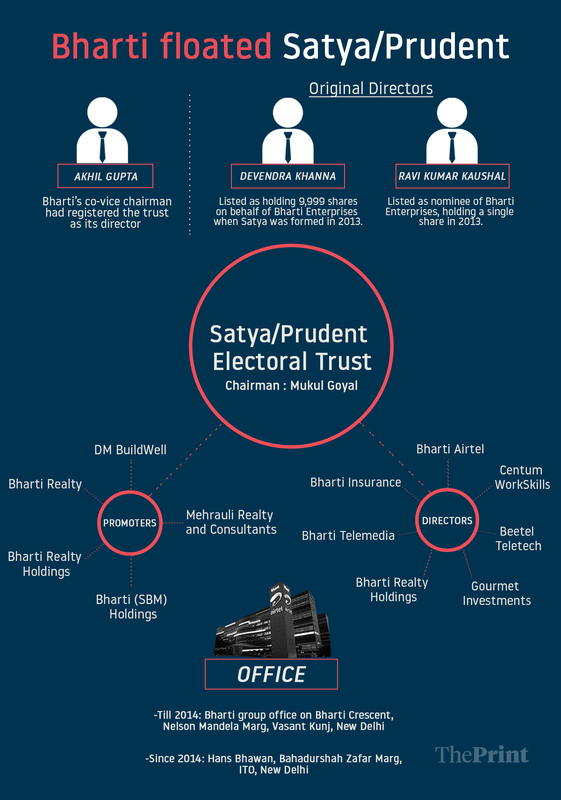 A deep dive into this mine of data shows that one particular trust has emerged as the clear leader in the amount it handles – the Satya Electoral Trust, or as it is known now, the Prudent Electoral Trust. Its collections have shot up more than three times to Rs 283.73 crore in 2016-17, accounting for 87.18 per cent of all corporate donations to all electoral trusts, from Rs 85.4 crore in 2013-14 according to data released by the Association for Democratic Reforms (ADR). And the reason behind Satya/Prudent’s success may lie in the fact that it is promoted and run by one of India’s top conglomerates – Bharti Enterprises, whose companies include telecom giant Airtel, among others, according to documents accessed by ThePrint through the Registrar of Companies. Satya/Prudent was originally backed by 33 companies associated with the group — among its 33 directors are executives from Bharti Airtel, Bharti Insurance, Bharti Telemedia, Bharti Realty Holdings, the group’s skill and education wing Centum WorkSkills, Beetel Teletech, and Gourmet Investments, which promotes the Pizza Express chain of restaurants. The five promoters of the trust are DM BuildWell Pvt Ltd, which is headed by Bharti vice-chairman Rakesh Bharti Mittal, Bharti Realty Limited, Bharti Realty Holdings Limited, Bharti (SBM) Holdings Pvt Ltd, and Mehrauli Realty and Consultants Ltd, which is also associated with Bharti Realty. Initially, the trust operated out of the Bharti group office at Bharti Crescent on Nelson Mandela Marg in Vasant Kunj, New Delhi. It moved to Hans Bhawan on Bahadurshah Zafar Marg (ITO) in 2014, and changed its name to Prudent in 2017. Registrar of Companies documents show that a ‘resolution’ was passed by Bharti Enterprises at a meeting of its Board of Directors on 10 April 2013 to “promote and incorporate a wholly-owned subsidiary company to operate as a Section 25 company under the Companies Act”, as Satya Electoral Trust. The two subscribers listed in this copy of the resolution are Bharti Enterprises Ltd, through Devendra Khanna (group director at Bharti’s CMD’s office), holding 9,999 shares, and Ravi Kumar Kaushal (senior executive), listed as a nominee of Bharti Enterprises, with a single share. In keeping with the Companies Act, the 2013 resolution also recorded the consent of Bharti Enterprises to bear all requisite expenses for incorporation and promotion of the company. In October 2013, company secretary of Bharti Realty also issued a no-objection certificate, allowing use of its Nelson Mandela Marg property for Satya Electoral Trust. Bharti’s co-vice chairman Akhil Gupta had, following the resolution, moved the registration of the Satya Electoral Trust in 2013 on behalf of the company and soon after surrendered the position of director to Khanna and Kaushal, as per documents accessed. In March 2014, Khanna resigned from Satya’s board. Just one month before, Mukul Goyal and Ganesh Venkatachalam joined as the two directors to the trust, and its address moved to Bahadur Shah Zafar Marg. As per Registar of Companies records dated 31 March 2017, the only two shareholders in the Prudent Electoral Trust are now Goyal and Venkatachalam. 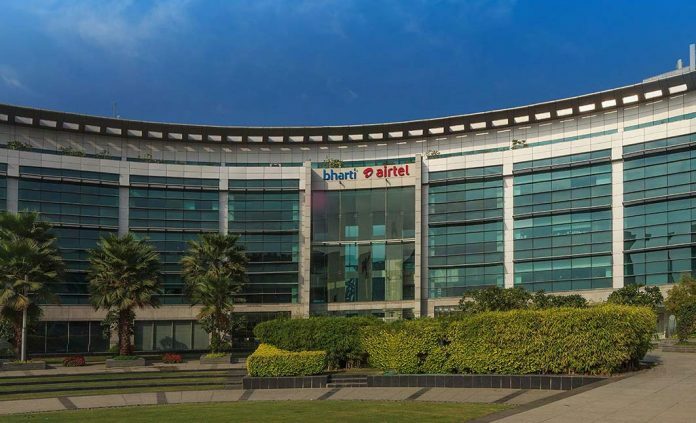 The parent company solidly backed the new trust with the biggest donation of Rs 28 crore from Bharti Airtel. This was 33 per cent of the total donations the trust received that year, followed by DLF Ltd’s Rs 20 crore, which was 23 per cent of the total donations. Akhil Gupta, in fact, made the highest individual contribution to any electoral trust so far – Rs 2 crore to Satya in 2013-14. Donors to the trust have remained loyal. In 2016-17, DLF Ltd has contributed the highest overall amount of Rs 28 crore amongst all donors across electoral trusts. Other DLF group companies DLF Cyber City Developers Ltd and DLF Commercial Developers Limited have donated another Rs 24 crore (15 and 9 crore respectively). Other loyal donors include Gujarat-based Torrent Group, Sajjan Jindal’s JSW Energy Ltd, Shyam Bhartia’s Jubilant Bhartia Group, GMMCO, Hero Motocorp and National Engineering Ltd. In 2016-17, the Shroff Group’s United Phosphorus Ltd came into the picture, contributing Rs 25 crore. The Aditya Birla Group’s UltraTech Cement and Grasim were among the top ten donors, as was the Essar group. The trust changed its name from Satya to Prudent last year, but not its donation preferences. The wealthiest trust prefers funding BJP over all others, according to the data. Of its total donations of Rs 85.4 crore in 2013-14, Satya donated Rs 41.37 crore, or 48.44 per cent, to the BJP. In 2015-16, it received Rs 47 crore and donated 95.74 per cent of it (Rs 45 crore) to the BJP, and the remaining money to the Congress. 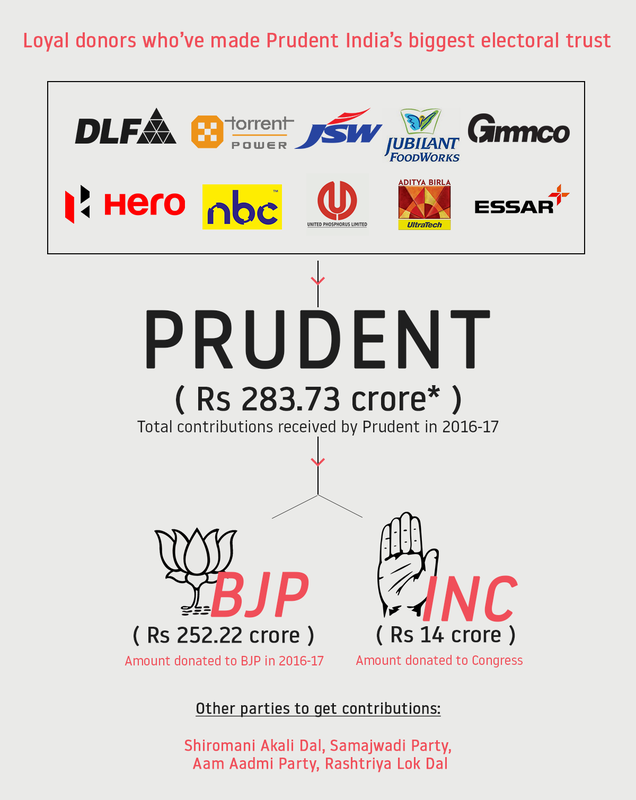 In 2016-17, the renamed Prudent trust donated 88.90 per cent (Rs 252.22 crore) of its total contributions to the BJP, while the Congress received Rs 14 crore. Other parties that Prudent donated to in this financial year were the Shiromani Akali Dal, the Samajwadi Party, the Aam Aadmi Party and the Rashtriya Lok Dal. When ThePrint asked the Prudent Electoral Trust how these allocations were decided, there was no response. Mukul Goyal, its chairman, didn’t respond to repeated queries. The Memorandum of Association for the Prudent Electoral Trust says that “the company as an electoral trust shall distribute funds only to the eligible political parties”. An ‘eligible political party’ has been defined as one registered under section 29A of the Representation of the People Act, 1951 (43 of 1951). Asked for comment, Raza Khan, head of Bharti Enterprises’ corporate communications, said Prudent was run by an independent board. “We would like to clarify that Prudent Electoral Trust is an independent electoral trust and is governed by an independent board. Various leading corporates have been donors to the trust. These include Hero Motocorp, Bharti Airtel, Jubilant Foodworks, GMMCO Ltd, National Engineering Industries, Orient Cement, DLF Ltd, JK Tyre and Industries, India Bulls Housing Finance, Kalpataru Power Transmission, among others,” Khan said in an emailed response. Questions emailed by ThePrint to JSW, UPL, Essar, DLF and many other corporate donors didn’t elicit any response on whether the donors to the trust had any say in deciding the party-wise allocation. That electoral trusts are key funders of political parties today is underlined by data. The details on donors to these trusts have, however, only come to light after 2013. Between 2004-05 and 2011-12, six electoral trusts had donated a total amount of Rs 105 crore to ‘national parties’. Then, in January 2013, the UPA government notified the Electoral Trust Scheme, which allows the setting up of an electoral trust under Section 25 of the Companies Act, 1956. The scheme requires that 95 per cent of contributions received by the electoral trust in any financial year be distributed to political parties registered under Section 29A of the Representation of People Act, 1951, within the financial year itself. Then, in June 2014, the Election Commission introduced transparency guidelines, which asked all new trusts formed after January 2013 to submit an annual report containing details of contributions received and disbursed by electoral trusts to political parties. Seven electoral trusts were formed post January 2013 – Satya Electoral Trust, Pratinidhi Electoral Trust, People’s Electoral Trust, Progressive Electoral Trust, Janhit Electoral Trust, Bajaj Electoral Trust and Janpragati Electoral Trust. According to ADR data, between FY 2013-14 and 2016-17, a total of nine registered electoral trusts donated a total of Rs 637.54 crore to political parties. The contribution to political parties from 2013-14 has risen from Rs 85 crore in that year to Rs 325.27 crore in 2016-17. Prudent Trust alone mobilised over Rs 280 crore or more than 85 per cent of the total amount. Of the total 21 registered electoral trusts, only 14 submitted their contribution reports, and just six said they had received contributions in 2016-17. While Prudent may be the top trust, there are other major corporates in the fray as well. The MP Birla group-backed Paribartan Trust received Rs 0.50 crore in 2016-17, with the entire amount going to the Trinamool Congress. The Murugappa Group’s Triumph Trust gave its Rs 0.1 crore collection to the Congress. The Janata Nirvachak Trust gave 100 per cent of its funds to the BJP, with Rs 18.5 crore of the total Rs 25 crore coming from the famed ‘cotton man’ of India, Suresh A Kotak, and the rest from Infina Finance of the Kotak family. The Samaj Electoral Trust counts the TVS Group and the Birlas among its donors and its contributions are spread out – in 2016-17, it gave Rs 2 crore to the BJP, Rs 1.5 crore to the Congress, Rs 20 lakh to the Rashtriya Lok Dal, Rs 15 lakh to the Jammu and Kashmir Peoples Democratic Party, and Rs 10 lakh to the Jammu and Kashmir National Conference. The Mahindra-backed New Democratic Electoral Trust made two donations totalling Rs 11 crore to the BJP and one to the Shiv Sena (Rs 1 crore) during FY 2016-17. In fact, Prudent and Samaj are the only two trusts which have donated to five or more political parties, the common ones being BJP, Congress and RLD. But there are also trusts like the Tata-backed Progressive Electoral Trust, which mopped up Rs 25 crore in 2014-15 but showed no contribution in 2016-17. The Bajaj Group-backed Bajaj Electoral Trust and the Vedanta-backed Janhit Trust also reported zero contributions in 2016-17.